For other uses, see Bolshoi Theatre (disambiguation). The main building of the theatre, rebuilt and renovated several times during its history, is a landmark of Moscow and Russia (its iconic neoclassical façade is depicted on the Russian 100-ruble banknote). On 28 October 2011, the Bolshoi was re-opened after an extensive six-year renovation. The official cost of the renovation is 21 billion rubles ($688 million). 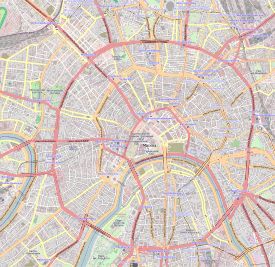 However, other Russian authorities and other people connected to it claimed much more public money was spent. The renovation included restoring acoustics to the original quality (which had been lost during the Soviet Era), as well as restoring the original Imperial decor of the Bolshoi. 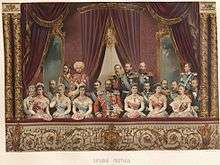 The company was founded on 28 March 1776 by Prince Pyotr Vasilyevich Ouroussoff and Michael Maddox. 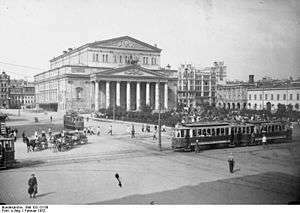 Initially, it held performances in a private home, but it acquired the Petrovka Theatre and on 30 December 1780 it began producing plays and operas, thus establishing what was to become the Bolshoi Theatre. 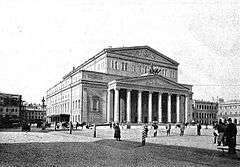 With the destruction by fire of the Petrovka Theatre on 8 October 1805, it was replaced on 13 April 1808 with the opening of New Arbat Imperial Theatre, but, as a consequence of the French invasion of Moscow in 1812, fire destroyed that theatre. The renovation included an improvement in acoustics, to attempt to replicate the sound believed to have existed in pre-Soviet times, and the restoration of the original Imperial decor. The building's foundation and brickwork were thoroughly reset. Inside, the entire space was stripped from the bottom up. The 19th-century wooden fixtures, silver stage curtain and French-made red velvet banquettes were removed for repair in specialist workshops. Outside, on the top of the façade, the double-headed eagle of the original Russian coat of arms was installed in the place where the Soviet hammer and sickle had been mounted for decades. 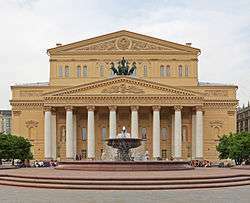 The Bolshoi Theatre is famous throughout the world. It is frequented by tourists. As a result, prices can be much higher than in other Russian theatres. This is especially the case for ballet, where prices are comparable to those for performances in the West. 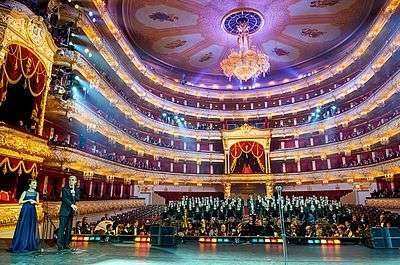 For local citizens, concerts and operas are still relatively affordable, with prices ranging from 100 rubles (for students, for balcony seats for matinée performances) to 15,000 rubles (for seats in the orchestra or stalls). 1 2 3 4 Elder, Miriam (22 March 2011). "Bolshoi rocked by scandal and intrigue | Stage | The Guardian". Retrieved 26 October 2015. ↑ "Bolshoi Theater raises curtain after six-year restoration". RIA Novosti. 28 Oct 2011. Retrieved 29 Oct 2011. ↑ "Today in History - September 18". WorldofQuotes. Retrieved 2011-10-30. ↑ Amie Ferris-Rotman (2010-09-21). "New musical director opens Bolshoi's 235th season". Reuters. Retrieved 2011-06-01.